Could someone stop by and help this member? Is it possible to add files to a system image? I did leave a simple response so he? wouldn't be left hanging. I was afraid of that TZ, the original poster started his thread in General Discussion and it has since been moved to Backup and Restore, this is the link now: Is it possible to add files to a system image? I've been reading this thread and like many here am a huge proponent of drive imaging. Started with a DOS 5/Norton Ghost boot disk decades ago, same strategy. OS/Apps on one partition, user data on another. I prefer using bootable media for backup and restoring since in my experience with XP and 7 it is much faster and doesn't require installing anything on the system you are imaging. My preferred imaging software is Acronis 2019 from bootable ISO. I have used it to backup AND restore XP, Windows 7, 8.1 and Ubuntu 12.04. We all have our favorites that get the job done for us. I used to carry a CD case with all my bootable CDs/DVDs for Acronis, Hirens, BartPE etc. That CD case is now collecting dust since I discovered Grub4DOS. I now have most of my bootable CD/DVD images (ISO) on a bootable USB pen drive. 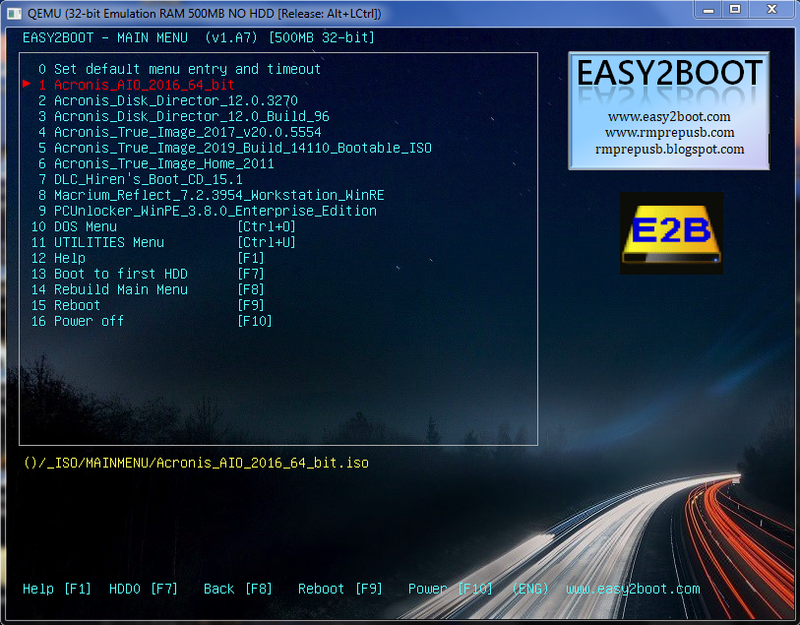 You can download the easy2boot.com software and use it to format and create the grub4dos bootable menu for your pen drive. Then you merely copy your ISO images to the _ISO/MAINMENU subdirectory on your pen drive and presto! Multi-boot USB pen drive. A few caveats; the file system is FAT32 so max file size is 4GB (most bootable imaging software is far below this range so it shouldn't be a problem). While this worked flawlessly for me on computers using legacy BIOS I couldn't get it to boot fully on UEFI machines. There appears to be a method to convert the pen drive so it works with UEFI but I haven't tried it yet - If I get it working I'll post a follow-up. For UEFI I had to use RUFUS which, like easy2boot, formats the pen drive, makes it bootable and copies the appropriate files from your bootable ISO to the pen drive - I had to use this method to successfully boot Acronis 2017 and backup a Dell UEFI laptop. I have also used RUFUS in the past to create a Windows 7 installation pen drive from an ISO. The only drawback is no multi-boot with Rufus - only 1 bootable image per pen drive. I'm going to play around with other software and see if I can create a multi-boot UEFI for modern systems but I find it's much easier to carry a pen drive in my pocket with all my bootable utilities than a CD case.